iCollect247.com Online Vintage Antiques and Collectibles - The Bell of Virginia Tobacco Crate Label. Late 1800's. The Bell of Virginia Tobacco Crate Label. Late 1800's. Item: The Bell of Virginia Tobacco Crate Label. Late 1800's. 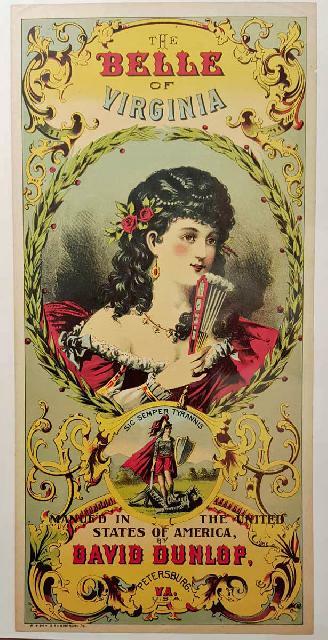 The Bell of Virginia Tobacco Crate Label. Late 1800's. Manufactured by David Dunlop, Petersburg, Virginia. Lith by A. Hoen & Co., Richmond, VA. Unless noted, any glare or wrinkles is from the shrink wrap. Condition (Near Mint). Size: 12¾" x 6¾".